Hours: Friday, Saturday and Monday, 7:00 a.m. to 7:00 p.m. The purpose of this Standard Operating Procedure (SOP) document is to define the normal operating procedures at each Bartow County Department of Solid Waste Collection Center. This document will address the type and amount of household solid waste that may be disposed of at the collection centers, the types and amounts of other solid waste which may be disposed of at a collection center, who may dispose of their household waste at a collection center, and collection center rules. Bartow County residents are urged to recycle or reuse as much material as possible to save costly landfill airspace. The collection centers and landfill are the property of Bartow County, in other words, these are your facilities to help Keep Bartow Beautiful. This document is intended for the fair and equitable waste disposal needs of all Bartow County residents. 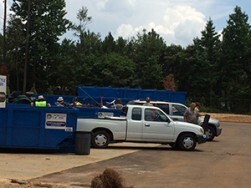 Bartow County provides for the free disposal of day-to-day generated household solid waste for each of its citizens through a series of twelve (12) solid waste collection centers, a state of the art Subtitle D solid waste landfill and an inert (tree and yard debris) waste processing facility. The collection centers are intended for the use of Bartow County residents as a means of disposing solid waste generated on a day-to-day basis in their homes. The landfill is intended to serve as solid waste disposal facility for Bartow County residents who must dispose of large volumes of solid waste generated by other than normal day-to-day activities, commercial and private businesses, industry, and government. No out of County waste, waste from businesses, rental properties, or other commercial enterprises may be disposed of at the collection centers. Bartow County citizens may use the collection centers for the disposal of household solid waste. This service is provided for Bartow County citizens only. This means that the only solid waste accepted at these facilities is that waste which comes from a citizens home that is generated on a day-to-day basis. We will accept household garbage, recyclable materials, appliances (white goods), furniture, scrap tires (four per person per year), tree and shrub clippings, used paint cans, paint, and used motor oil. When disposing of solid waste at a collection center, please ensure that all waste is placed in a roll-off container or compactor. Please, clean up after yourself. We will accept small amounts of construction and demolition (C&D) material generated from residents homes only. C&D material may include lumber (new and used), windows, doors, roofing material, flooring material, siding material, sheetrock, plumbing and related fixtures, HVAC components, gutters, etc. We will not accept more than three (3) bundles of shingles per load per day. We will accept up to 80 cubic feet (2.5 X 4.0 X 8.0 feet), or the volume of a standard size pick-up bed below the rails. However, if a resident brings more than 80 cubic feet of C&D material per load per day, as determined by the collection center attendant, that resident will be deferred to the landfill. Those residents deferred to the landfill may dispose of up to one ton of material free of charge per load. An unlimited number of loads may be taken to the landfill during normal operating hours. As stated above, we will accept tree and yard debris. This material is related to the normal day-to-day pruning and maintenance of trees and bushes. We will not accept whole, cut trees, limbs larger than 2 inches in diameter, limbs longer than 8 feet, or loads that are larger than 3.5 cubic yards (4 feet wide by 8 feet in length by 3 feet in height) in volume. Residents may dispose of one load of this material per day under the above guidance at a collection center. Those residents whose loads do not meet the above criteria will be deferred to the landfill. Those residents that are deferred to the landfill may dispose of up to one ton of material free of charge per load. Recycling bins are available at each collection center for the disposal of recyclable material such as glass, plastic, newspaper, and cardboard. Residents are asked to breakdown or flatten cardboard boxes, collection center attendants will supervise this activity. While recycling does provide the County some revenue, the revenue produced does not cover the expenses the County incurs for processing recycled goods. Recycling prevents material from being disposed of in the landfill which will add to its lifespan. We encourage all residents to recycle all that they can to save both County and natural resources. The collection centers will accept furniture and appliances. County residents are encouraged to donate those items which may still be used or repaired to a charitable cause for the benefit of both less fortunate citizens and County resources. County residents will be asked to take large or bulky loads directly to the landfill. Unused paint and paint cans will be accepted but not more than five, one gallon containers or one, five gallon container will be accepted per resident per day. County residents are urged to reuse or recycle unused paint. Larger loads of unused paint may be taken directly to the landfill. The following collection centers are open Monday, Tuesday, Thursday, Friday, and Saturday, from 7:00 A.M. to 7:00 P.M. These sites are also open Sunday from 1:00 to 5:00 P.M. The collection centers are staffed by employees of Bartow County who are responsible for the upkeep of the facility, public safety, directing County residents in the disposal of solid waste, and to ensure all County, State, and Federal solid waste disposal rules and regulations are upheld. The attendants are present to instruct Bartow County Residents as to where to dispose of their solid waste. Collection center attendants, when asked by elderly and/or disabled/handicapped Bartow County residents, will provide limited assistance to these citizens to dispose of their solid waste. Collection center attendants who are themselves elderly and or disabled/handicapped will inform the citizen that they are unable to render assistance in a courteous manner and politely instruct them to either take the material to another collection center and/or the landfill. For those citizens who are deferred to the landfill, located at 40 Allatoona Dam Road, we ask that you enter the landfill through the Landfill Collection Center directly in front of the facility. Once there, residents will be required to weigh in and out using the scales designated as such. Please read and adhere to all posted signage, lights, and scalehouse instructions. For your convenience, we have placed roll-off bins adjacent to the scalehouse. Please remember that the main entrance of the landfill and main scales are used for permitted, commercial haulers. The residential scale is open for County residents Monday through Friday 8:00 A.M. to 5:00 P.M. and on Saturday 8:00 A.M. to 12:00 P.M. The landfill is closed on Sunday.